Cydia Unlocks: How To Reset iPhone Root Password Using Cydia?? How To Reset iPhone Root Password Using Cydia?? Hey friends, here I am sharing a tutorial on how to reset iphone root password? Once you have jailbroken your iphone changing the root password is easy and necessary at times. Once jailbroken your iphone is subjected to a vast variety of different apps and tweaks. There is a wide range of publisher and each one has a different app designed that can access and alter root files of your iphone. Thus changing the root password denies access to unauthorised files and keep your iPhone/ iPad safe. Here we will use Cydia to download an app that will help us reset the password. Also see - Cydia lockscreen tweaks for iphone. Search for "Mobile Terminal". Install it on your iOS device. Search for "MTerminal" developed by lordscotland. Download it on your iPhone. We will now proceed to further steps. These steps are same for all versions of iOS. Once you have downloaded the "Mobile Terminal" or "MTerminal" accordingly you can move further to reset iPhone root password. 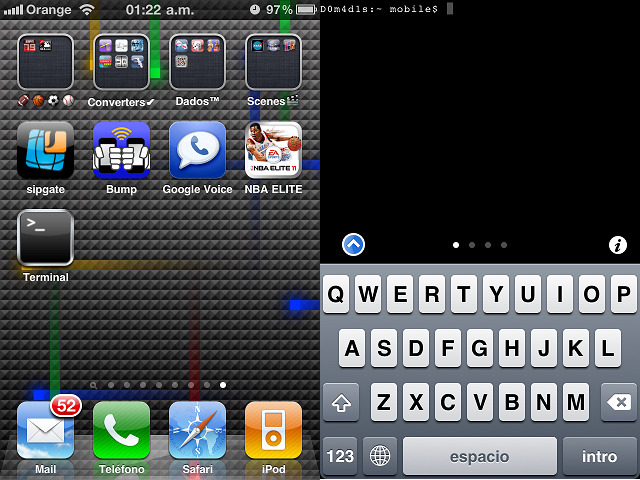 Now launch Mobile Terminal/ MTerminal app from your iPhone's homescreen. A prompt screen will appear. Something silly will be written on it like "iPhone: - mobile$" etc. etc. Just after it you have to type "su root". After typing tap the return key. Now it will ask you for the password. By default Apple sets every iPhone's root password as "alpine". We will change it to something more complex and unique so that it becomes difficult for any app or cydia tweak to pass through. For now you have to enter "alpine". Enter "alpine" and tap the return key. Now type "passwd". This is the code for changing password. Now it will ask you for the new password. Enter a new password, one which is difficult for others to guess but easier for you to remember. Type the password and tap the return key. It will ask to you twice. So enter the new password twice. Note - When you will type the new password your keypresses will not be displayed on the iPhone's screen. This is done for security reasons. So ignore it and keep typing. Your iPhone's root password is now changed. Do not close the Mobile Terminal/ MTerminal screen. But also change the mobile user password. This is the regular user account on your iPhone. On the prompt screen enter "passwd mobile" and tap the press the return key. It will now ask you for the new password. It will ask you twice so enter the new password two times. That 's it. You are done now. you have successfully followed the the "How o reset iPhone root password using Cydia" tutorial and reset your passwords. Your iPhone is now safe and less prone to unauthorised access by unwanted apps and Cydia tweaks.